Pipper’s personal trainer pal, Chance, keeps Pipper in top form. 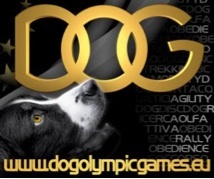 They’re planning to compete in the next Steel Bone Triathlon – but first they’re going to check out the competition at the 2012 Dog Olympics taking place in Lignano Sabbiadoro, Italy (October 15-17). The competition includes agility, orienteering, and even dancing. Pipper is particularly interested in the swimming competition and can’t wait to get her paws wet. Are there any dog events taking place in your area? Go to comments to share with us.